If you have a tween or teenager in your life that you’ve no doubt noticed their self-indulgent social media behaviour. You know what I’m talking about – the endless duck face selfies posted to their Instagram feed that are filtered just perfectly to make them look like their favourite Pretty Little Liars star or Kardashian. The resultant flurry of comments from their friends consist of words like ‘beautiful, perfection, gorg, and bae.’ This happens until the next friend posts their very own selfie and the cycle continues on their page. Our kids are living in a world where the majority of their self-image and positive reinforcement comes from their friends telling them how amazing they are on social media, and where narcissism and selfies are the new black. As much as I’ve tried to talk to my kids about this I’ve also resigned myself to the fact that ‘it is what it is’ with kids these days, and to not worry too much about it. I’ve also noticed recently that this trend has started to infiltrate my facebook feed, but this time it’s not my teenager or any of her friends posting their selfies and asking you to ‘like for a comment’ while fishing for compliments, it’s grown adults. It’s adults who have started to post more and more ‘selfies’ to their FB feed under the guise of perhaps asking for advice, or showing off a new haircut or even a new outfit or telling you where they’re going, but what these selfies are really screaming is ‘someone tell me how beautiful and gorgeous and perfect I am!! !’ ME ME ME! Don’t get me wrong, I’ve posted a few selfies in my time, especially if I’m having a good hair day, but if you glance at my Instagram feed or check out my FB posts chances are you’ll see more pictures of my kids or my cats than you will me. 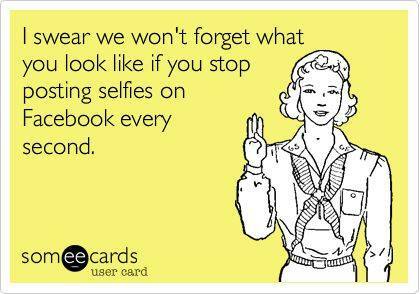 The same goes for the most of my friends too, and the selfies they post are ones I want to see anyway. I’m not talking about people who post whole albums of their vacation travels, or when they attend an event that they document, or a get together with old friends. That’s what I want to see when I log in to Facebook every morning; I want to see what’s going on in my friends lives and what their kids are doing and where they’re going on vacation. What I don’t want to see is the increasingly popular Monday morning glamour shot of their coffee cup that shows a fragment of the handle of the cup but a full shot of perfect hair and lipstick looking dreamily out a window. Or the random mid day posting of the outfit of choice of the day complete with perfect hair and perfect angles just begging for someone to tell them how great they look. Stop it! Facebook isn’t your personal vanity mirror. I’m all for sharing the important details of your life on Facebook. Got a new haircut? I want to see it and comment on it. Need to choose an outfit for an important meeting or appearance coming up and want to crowdsource opinions? Hells yes, I will weigh in. Been on vacation and want to post some beautiful family pictures or even 15 different shots of your drink of choice while you were away. YES! I want to see that! What I don’t want to see are blatantly clear, nacissitic selfie shots begging people to tell you how amazing you look, or how skinny you are when you clearly know all this already. YOU ARE A GROWN UP! Stop acting like my teenager and her instagram friends, and stop with the selfies that are clearly begging for adoring comments because they’re getting old. I have a hard time with young people and their selfies in constant need of self assurance, but there’s something more disturbing about it when it comes from adults. Sure there’s a level of insecurity to them, but there’s also an underlying tone of narcissism that just keeps being fed with each and every ‘I love this picture of you’ and ‘you look amazing’ comment. My eyes roll now more than ever as I peruse my social media feeds, slowly skipping over the comment bait pictures being posted more and more often. I want to grab these people and put them in front of a mirror Stuart Smalley-style and tell them ‘they’re good, smart enough, and doggone it, people like them!’ The narcissistic selfie is turning me into more of a sceptic than I already was. If every selfie you post shows your hair and makeup and outfit perfectly planned (the narcisisstic selfie isn’t limited to just women either), but you’re talking about your cat who can barely be seen behind your perfectly coiffed hair, I’m on to you. So go ahead and post your pictures of your Starbucks order and your cute kids and your dog, but let’s leave the gratuitous selfies to the teenagers of the world and the Kardashians, ok? Kelli Catana has had a longstanding love affair with celebrity news and gossip for as long as she can remember. It didn’t take long to for her to discover she wasn’t just happy reading about it, but that she wanted her own forum to spout opinions – of which she has many . Hence, after she leaving the corporate world to stay home to raise her 4 children, her love affair with blogging began. Her obsession with celebrity started right around the time that Dylan McKay was introduced to Brenda Walsh, and if you don’t know who they are you probably can’t be friends. Kelli loves great movies and bad reality television and books that have you staying up until 3 am because you just can’t put them down. You can find Kelli weighing in on her all her favourite celebrity news over at her blog kellidaisy.com, she’s also a contributing writer for Entertainment Tonight Canada, and she writes a lifestyle blog for Hot Moms Club. Ha ha — I can always count on you to say what I am thinking, Kelli! I am legitimately scared for our daughters, growing up like this, but for women our age to participate in this Mirror Mirror On The Wall, Who’s The Fairest Of Them All practice, is just embarrassing. Better of feet pics, but still. That said, bring on your champagne cocktail photos! I love ’em! And comment bait? So stealing that. I like this article. I’m a selfie queen. Honestly I really love the artistic end of self shots. I’m the “photographer” among family and friends. It’s not about showing perfect hair and makeup for me, but you are right it is for many. Thanks for sharing & giving me something to think about. This is a little bit of a different view I’m about to put out there, but so be it…I think teenagers and the selfies that have for their purpose to gain as many likes and comments a good thing for their self confidence. My daughter at 15 is so self assured and confident, that I can only assume it’s from putting herself out there on Instagram and reading lovely comments from her friends. Yes, a lot of it is gratuitous flattery, but I can’t help but wonder if I would have been a less insecure adult if I had grown up with half the praise our children are receiving from their peers. As for the adult selfies, yeah, I’m on board with that. And those are only surpassed by the cryptic FB posts where someone says something where you wait for a tragic update but it never comes. Excellent post and definitely food for thought.